Update provisions of the Pacific Salmon Treaty and the Columbia River Fish Management Plan based on the latest survival rate and catch level information. The two harvest management processes affecting Columbia River treaty Indian fisheries occur under the U.S. v. Oregon Columbia River Management Plans and the Pacific Salmon Treaty between the governments of Canada and the United States. Since the mid-1990s, the parties to U.S. v. Oregon struggled to reach agreement on fisheries and production actions. In many years, litigation occurred and annual or interim agreements were only reached through court-ordered negotiation, settlement orders or court rulings. The parties to U.S. v. Oregon negotiated a successor agreement to the 1988 Columbia River Fish Management Plan from 1997-2008. After many years of negotiation, the 2008-2017 U.S. v. Oregon Management Agreement was concluded in May 2008. The 2008-2017 agreement is a stipulated court order in U.S. v. Oregon and will guide management decisions for mainstem Columbia River fisheries and Columbia Basin production programs until 2017 but will not be used to set precedent or prejudice future allocation or production actions. Each tribe is responsible for planning, coordinating and managing tributary fisheries on those fish species that return to areas within their respective treaty territories. Thus, some runs and stocks of fish are subjected to treaty harvest in the mainstem Columbia River and again in local tributary fisheries as fish are migrating to their rivers of origin to spawn. Other tributary fisheries are not covered under the current management agreement. Tributary fisheries in places like the Snake River Basin are managed consistent with tribal harvest plans and harvest management frameworks for salmon (including steelhead) in that basin. In May 2008 the Pacific Salmon Commission recommended a new bilateral agreement (in particular, see Chapter 3) for the conservation and harvest sharing of Pacific salmon to the governments of Canada and the United States. The product of nearly 18 months of negotiations, the agreement represents a major step forward in science-based conservation and sustainable harvest sharing of the salmon resource between Canada and the United States. Approved in December 2008 by the respective governments, the new fishing regimes are in force from the beginning of 2009 through the end of 2018. The new 2008 treaty agreement calls for reducing the catch off Southeast Alaska by 15% and Canada cutting its harvest off the West Coast by 30%. The changes send an estimated one million more chinook to Puget Sound and the Columbia River. Chinook are the target, but the 10-year agreement also covers coho, chum, pink and sockeye salmon. The agreement’s aim is to achieve one of the original goals of the treaty: halt the decline and rebuild chinook stocks coastwide. The 2008-2017 U.S. v. Oregon Management Agreement contains the fundamental elements the tribes identified at the start of the negotiations. Fishery opportunity is enhanced as compared to previous agreements; and treaty harvest will again be protected by federal court order. Many of the harvest provisions of the 2008 agreement build on the harvest rate schedules as described in previous agreements (notably, the 2001 and 2005-2007 Interim Agreements), and for others the parties agreed to new abundance-based harvest rate schedules. The abundance-based harvest regime addresses conservation concerns and provides greater flexibility in shaping mainstem fisheries and enabling access to harvestable fish. Mainstem and certain tributary treaty fisheries are to be managed according to these harvest guidelines. The 2008 agreement expires by its terms in 2017. For the remaining period of the agreement, key outcomes include: mainstem fisheries that comport with its conservation and allocation commitments; adherence to framework commitments and procedures; implementation of the agreement’s production programs; and development of regulatory coordination mechanisms that provide for tribal enforcement. Also see the updated Columbia River Fish Management Plan recommendation. Interception of Pacific salmon bound for rivers of one country in fisheries of the other has been the subject of discussion between the governments of Canada and the United States since the early part of the last century. In 1985, after many years of negotiation, the Pacific Salmon Treaty was signed, setting long-term goals for the benefit of the salmon and the two countries. Prevent over-fishing and provide for optimum production. The desirability in most cases of reducing interceptions. The desirability in most cases of avoiding undue disruption of existing fisheries. Since the Spirit of the Salmon Plan was released, significant revisions to the Pacific Salmon Treaty have been made: The arrangements and institutions established in 1985 proved effective in the early years of the salmon treaty but became outmoded after 1992, when the original fishing arrangements expired. From 1992 to 1998, the two countries were not able to reach agreement on comprehensive, coastwide fisheries arrangements. In 1999 government-to-government negotiations culminated in the successful renewal of long-term fishing arrangements under the Pacific Salmon Treaty. In December 2008, the governments of Canada and the United States approved the new fishing regimes, described above and in force from the beginning of 2009 through the end of 2018. The agreement represents a major step forward in science-based conservation and sustainable harvest sharing of the salmon resource between the two countries. Improve tribes’ ability to meet their First Food ceremonial needs for salmon and clean water. Continue to see that all tribal members have opportunities to fish for subsistence in the mainstem and tributaries. Gain full access for tribal fisheries to harvestable hatchery and wild fish. Appropriately allocate harvest among different (tribal and non-tribal) fisheries. Continue improving technical information and tools. See the updated Harvest Management (In-river) recommendation. Expand funding for harvest monitoring. Integrate new technical results into harvest management decisions. Continue to implement abundance-based management provisions of the treaty for ocean fisheries and move away from aggregate abundance-based management. Address mark-selective fishing proposals of the United States and Canada. See the new Mark Selective Fisheries recommendation. Administer the enhancement funds established in the 1999 agreement to increase returns of naturally spawning chinook. Meet annually with Canadian First Nations. Implement recommendations from the performance review, as appropriate. Advocate for funding to implement fishing regimes and maintain information base. Review and implement recommendations of habitat technical committee, as appropriate. 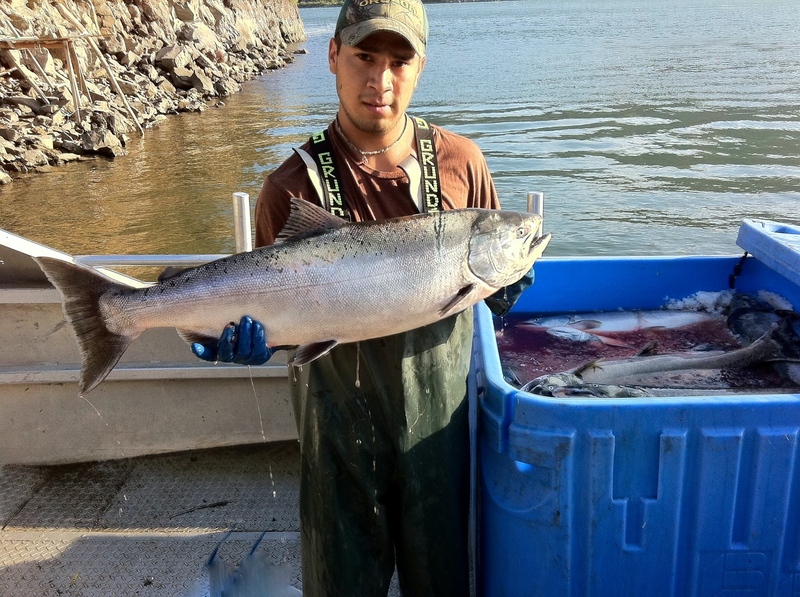 Reggie Grace (Yakama) and a chinook salmon he harvested from the Columbia River. We are fortunate to have a growing number of young tribal members. Many of them want to make salmon fishing part of their livelihood. One of the goals of the Spirit of the Salmon Plan is to reclaim anadromous fish resources for future generations. We must have our fish!